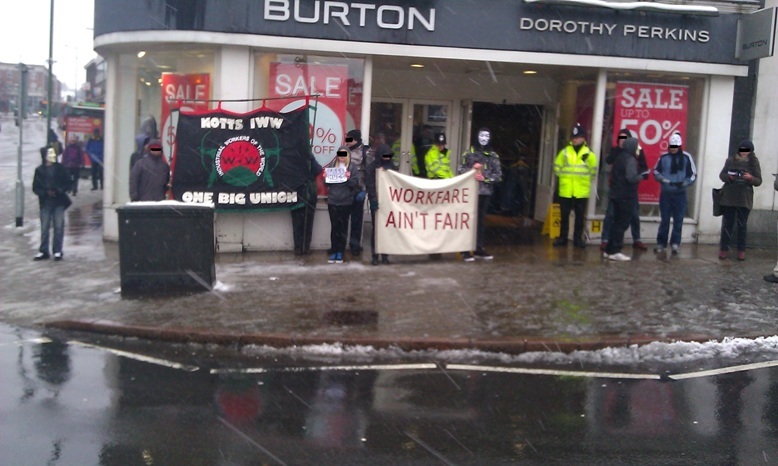 The Nottingham campaign encourages everyone to show their opposition to workfare by coming on the Burton blockade against workfare – Saturday, 23rd March 2013, 2.00pm. Meet at the left lion in Nottingham City Centre, Old Market Square. Unable to pay your Council Tax Bill? Worried about getting into council tax debt? Want to build solidarity with other claimants to fight these cuts? Download flyer, or read on. Nottingham and Nottinghamshire Defend Council Tax Benefit Campaign is running regular sessions in the city centre from Thursday 21 March to monitor the impact of Council Tax Benefit cuts, provide information to people who may not be able to pay their bills and invite them to join the campaign. The Government has scrapped the national Council Tax Benefit scheme and from 1st April this year local councils have to start their own scheme with less money. Under Nottingham City’s new Council Tax Support Scheme, council tax benefit is being cut by 8.5% for all working age claimants and from April 2014, Nottingham City Council proposes a cut of 20%. This is not an individual problem for claimants, we need to build solidarity to support people who can’t pay and build a campaign to fight these cuts. Saturday, March 16, 2013.1:00pm. In Nottingham alone, 4746 families will be affected by the Bedroom Tax. We oppose the Bedroom Tax in principle & in detail. Not one person should be forced to pay it. This is a peaceful demonstration to protest against the injustice of the Bedroom Tax that penalises the disabled, single parents, families of those recently deceased, foster parents and the parents of children in the army or at university: This will be a static demonstration rather than a protest march. It will be interesting to see which approach is successful. Nottingham City Council have a long way to go to convince City residents it has their interests at heart, having cut many services that affect housing and homelessness over the last few years and is also poised to implement the government’s council tax benefit reform which will result in some council tax being due if you are on certain benefits. 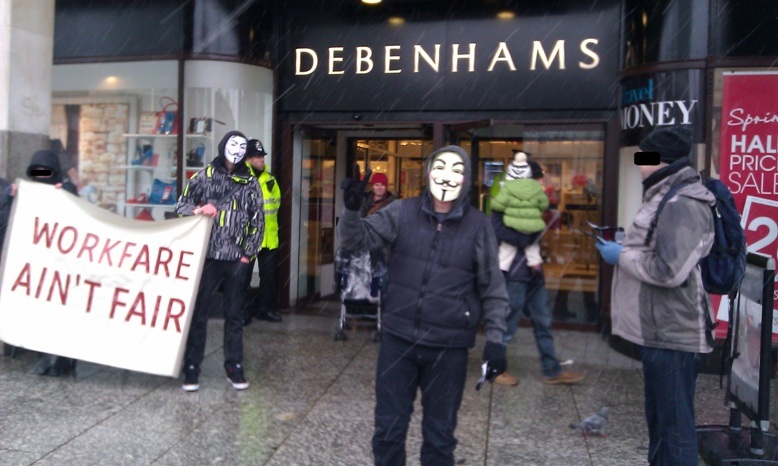 Nottingham against Workfare have announced a local action during the Boycott Workfare week of action. Saturday, March 23, 2013. 2:00pm until 5:30pm. 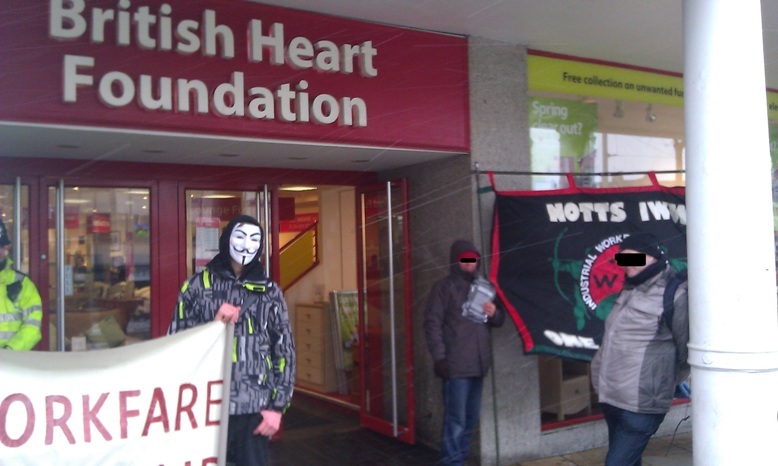 http://www.facebook.com/events/517491058274105/ Nottingham against workfare will be taken action against Workfare scummers Burton’s. Part of the Arcadia group notoriuous for their tax doging way, Burtons have been using those forced into workfare to stack their shelves and clean their floors for quite some time without ever paying them. We plan to close down their shop amd let them know how disgusted we are with them and others like them who continue to abuse the working class. The Government is pushing ahead with increasingly savage workfare policies despite the fierce resistance to the scheme causing many high street names and national charities to pull out. Unemployed people can now be sentenced to six months compulsory unpaid work as part of the Community Action Programme. On December 3rd last year – International Disabled People’s Day – the DWP introduced forced work for sick and disable…d claimants. Companies such as Superdrug, Argos and McDonalds, who have all been quick to take on unpaid workers on government schemes, have seen a year of boycotts, pickets, demonstrations and occupations due to their involvement in the scheme. Many national charities have pulled out as a result of protests, but some, such as The Conservation Volunteers (TCV), Salvation Army and Sue Ryder Foundation are unrepentent about their army of government subsidised unpaid workers. Many of the new workfare programmes depend on charities like these to provide placements. Workfare can be broken by showing these organisations that the public have clearly rejected unpaid work. Evidence has shown that mandatory work has no impact in actually helping someone find a job, the stated aim of the scheme. 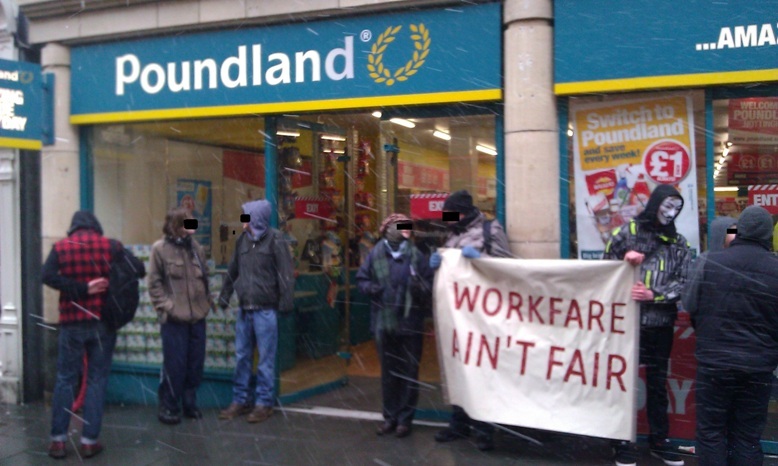 Instead workfare is used to replace real jobs, with some companies even caught taking on unpaid workers to fill temporary Christmas positions. Join Boycott Workfare on 18-24 March for a week of action against workfare exploiters everywhere. Take action in a town or city near you, join in online and show all those who profit from forced labour that we mean it when we say “if you exploit us, we will shut you down”.